VW buses are for hippies! Hippie buses! And they are dangerous! 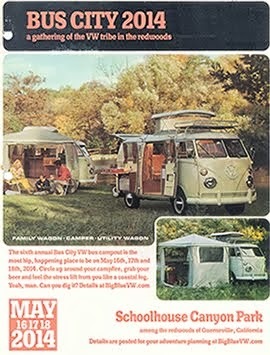 I was trying to think about the first time I was interested in a VW bus, although I'm sure I called it a van back then. I think RELL was the first bus I was ever in. Growing up, my parents were pickup truck people and left camping to the boy scout trips. Odd that I don't recall ever seeing one enter my life as a kid. Perhaps this has more to do with my parents' 80s republican leanings than the Michigan winters. In college, VW buses were strictly for the deadheads. These people shopped at a head shop downtown East Lansing called In-flight, a place that specialized in Dead clothing, frisbee golf and the trading of "bootleg" tapes, although you couldn't refer to them in the store that way. They had dreads and wore tie-died t-shirts and played hacky sack and they never talked to me. Except Tommy, a forced roommate one summer who was about as deadhead as you could get. It shocked me a few years later to run into him clean cut and may have shattered the notion that being a deadhead wasn't just a "stage". The hippie style was never much of a culture that I was attracted to, although I did have a tie-dye and did have some Dead CDs. Being a person who camped at that time, I was drawn to classic 4 wheel drive vehicles like my 1971 Toyota Landcruiser and, later, Jeeps - my parents still has the '85 CJ7 that I drove for a while although it is losing the battle against rust. And a 1986 Grand Wagoneer I had sold to... a dread-headed deadhead with a tie-dye t-shirt. Somewhere in my life, the roadtrip became the defining way of travel for me. Chugging along at 55 mph is nothing new having taken to those old 4x4s. And Michigan was ripe for roadtrips back when gas was $1 a gallon. My highschool friends and I headed all over Michigan one summer having created a Putt-Putt golf tournament/league. We would travel for hours for a relatively bad course, as getting there and getting into trouble was more the goal than winning the tournament. The next great adventure came when I made fishing my life. It was inspired by my friend Crazy Al, who seems so zen-like about life, that it is hard not to be drawn into his singular vision of catching fish equaling happiness. I believe he has a hat that says as much. For the next several years we would drive cross-state to meet a dams, landings, docks and ponds to fly, ice and topwater together. All of this time on the water meant many miles of pavement. Awhile after college and in need of a car, I had a opportunity to purchase a bus from an old girlfriend's dad, but scoffed at the price. The last time I had seen it the top had popped up from the wind and the bus was open to the elements. I can't recall the details of the bus or the price, but it seemed too high at the time. And then came vintage trailers. I was drawn to Airstreams, but quickly moved on to Shastas or old Spartans - never owning any but drooling over ones in horrible condition on the internet. My only venture into that realm was a ill-fated trailer bought in Indiana for $150. I trailered it back to Chicago with the intention of fixing it up, but never did and eventually gave it away. My real trailer experience came from a visit to the Shady Dell in Bisbee Arizona. Elizabeth and I rented the Airstream, because you should, but really, I was drawn to the Spartans and oddball ones they have there. Staying in the Airstream, fueled both Elizabeth's and my interest in a trailer. It seemed that Elizabeth caught the bug as much as I had, having her own dormant roadtrip addictions. 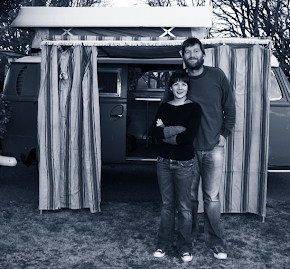 Living in Northern California and camping at least twice a month, talk moved from trailers to RVs and then, eventually, somewhere in between: a VW bus. As someone said recently, the VW bus is the backpacker of the RV world. It was around here that we took the trip in RELL, a 1973 Bus that you can rent south of LA. 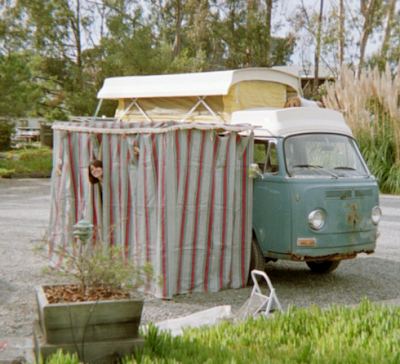 Before RELL, I'm not sure I understood the whole camper interior-thing. I just knew "those people" in college slept in them and camped in them and hit the road in them. And that, while roadtrip has been engrained into my blood, the vehicle had not. After RELL, it clicked for both of us. The perfect camping mobile. I'll admit a few things here: The hippies were right about a lot more than mainstream America cares to admit. Those deadheads in college were onto something. There is something cultural about the VW more than other cars. Car & Driver magazine called the VW bus the ultimate "negative status symbol... [p]lain as a brick, simple as a lawnmower, slow as glue, cheap to buy, cheap to run, and cheap to fix." Some people question the power of the VW. I would offer that no car in the world has had more power.